In this newsletter you’ll find recipes for using aromatherapy and massage together, including a massage oil for necks and shoulders. I am always amazed at the way our bodies tend to keep themselves balanced. We can support our bodies in this process, too—with nourishing food, relaxation, essential oils, and practices like yoga, movement, and massage therapy. I have a special place in my heart for massage! Did you know I used to be a Massage Therapist? Before I founded Aromahead Institute, I had a private massage practice for 10 years and ran a massage school in Ithaca, NY, with Cindy Black (The Finger Lakes School of Massage). It was an amazing time in my life. Massage can help relieve pain, loosen up our muscles and joints, and encourage us to feel connected to ourselves and the moment. It’s good for “acute” situations like helping us recover from an injury, and for longer-term self care (such as preventing too much tension from building up in our shoulders and leading to headaches). Massage can help us relax when we feel stressed, or can get our energy flowing when we are fatigued. It’s such a nourishing practice. And when we combine massage with essential oils, we can take natural healing to an even deeper level. In this newsletter you’ll find recipes for using Aromatherapy and massage together, including a Neck and Shoulder Massage Oil, and a Calm Energy Oil. Sore muscles? Massage can help with that! This recipe is made with three essential oils known to calm inflammation and help achy, tight muscles release tension. I think you’re really going to like this massage oil if you tend to carry tension in your shoulders, upper back, and neck (or if you sleep in a funny position and have trouble turning your head when you wake up). Make this blend in a 1 oz (30 ml) glass bottle. Combine the jojoba and essential oils, shake gently, and massage into sore areas. You can also use this on muscles that are sore or strained. Feels wonderful after a good workout! 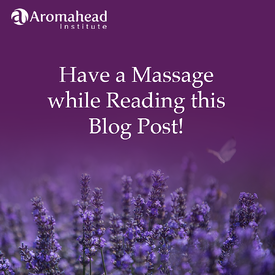 On the Aromahead Blog: Have a Massage while Reading this Blog Post! Aromatherapy and massage are a perfect match. Like peas and carrots, bread and butter, socks and shoes . . . you get the idea! When I started using essential oils in combination with massage, I was amazed at how effective they were at easing my clients’ pain. It was like the oils helped unlock deeper levels of natural healing in my clients’ bodies, minds, and hearts. I want to help you feel confident using Aromatherapy for your own massage clients. It feels so good to side-step the guesswork and confusion, and KNOW that you have an amazing blend to offer your clients that will relieve their pain! One of those people is Kelly Ablard, PhD, EOT, and amazing human being (pictured right). Kelly is one of Aromahead’s case study instructors, working with students in the Aromatherapy Certification Program as they formulate therapeutic blends for people and earn their Certification. Kelly has done a HUGE amount of independent work that supports plants, animals, and indigenous peoples around the world. Her latest project is about conserving Rosewood and supporting the people of Peru. Click here to read more about her project! Lauren Andrews runs AroMed Aromatherapy of Vermont, and is such an amazing person—she’s a Registered Nurse, a Certified Aromatherapist, an Aromahead graduate, and a business owner! Lauren started AroMed to help people use essential oils for stress-related illness and mental health. She sources all of her essential oils directly from small-scale farmers and distillers (I love that!) so she can fully trust the ingredients she’s using in her products and what she’s offering her customers. She has both a physical store (in Montpelier Vermont) and a beautiful online shop, where she sells all kinds of high-quality Aromatherapy products including essential oils, blended inhalers, a beautiful line of Chakra Gemaromas (roll-on blends designed to balance your chakras, with a gemstone on the lid of each! ), children’s blends, diffusers, and more. What a beautiful way to describe Aromatherapy! Check out her website to see more of what she’s creating and the presence she holds in the Aromatherapy world! 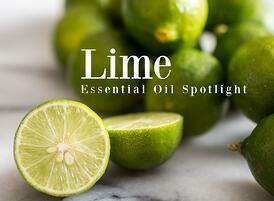 Lime essential oil (Citrus aurantifolia) is one of the happiest, most refreshing oils I know! It’s such a sparkly, tropical aroma, and every time I open my bottle of distilled Lime and take a deep breath, I can’t help but think, “Wow, this is amazing, it smells just like candy!” It always makes me smile. Invite Lime into your home, and it will clean everything up, leave every room sparkling, and open all your windows to let in a fresh, warm breeze. This Essential Oil Spotlight explores some fun ways to brighten your life with Lime, including a Raspberry Lime Massage Oil, Lime Aloe Foap Soap, and more. We also talk about an important safety issue for Lime: phototoxicity. Have you ever done a livestream? That’s where you turn on a camera—whether it’s on your phone, computer, or another source—and broadcast a live video to your audience on social media. Ecamm Live is software for Mac computers that lets you create amazing, high-quality livestreaming videos, and offers you a lot of fun options for doing so! It’s especially convenient because it connects right to Facebook, so you can livestream to your followers. You can overlay text or images onto the screen as you’re broadcasting, which is great if you want to include a logo or words like “special offer” for viewers to see. You can even pre-record your “live” video and then stream it out to your audience. Ecamm Live lets you see how many people are following your livestream, and keep up with comments they’re making. The Ecamm Live app is very popular because it’s so simple to use. Even if you have no experience livestreaming, you could download the app, connect it with Facebook, and be streaming a video to your audience in very little time. Ecamm Live has a free trial that lets you experience their software at no cost, and if you want to continue using it, the cost is under $40 (it’s not a subscription service, but a one-time up-front fee). Check out their website! If you have a PC (instead of a Mac) and want to use software like this, you can try OBS Studio (Open Broadcaster Software Studio), or Be Live. 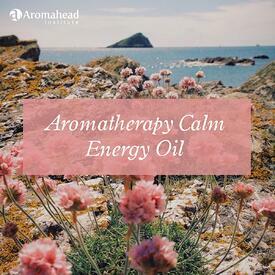 Have you ever wondered which essential oils are good for relieving stress? It’s easy to learn how to reduce anxiety with Aromatherapy, and I have a great DIY recipe to get you started. My Aromatherapy Calm Energy Oil blend is perfect for centering yourself when you are feeling stressed, and I think you’re going to love it. Read on to learn more about each essential oil to and learn why this recipe works so great to calm your nerves. Vetiver essential oil is a rich and earthy aroma, it’s made from roots of Vetiver grass. Vetiver essential oil is called “Oil of Tranquility” in some parts of the world because of how calming it is to your nervous system. Lavender essential oil is a balancing oil, it’s nourishing, supportive and uplifting, plus it smells so good! Grapefruit essential oil is a burst of energy, and it’s great when you are trying to come back to yourself! There are many kinds of massage therapy, and there are many ways to experience massage. You can get a massage from a friend or a professional massage therapist. You can book a session that lasts a few hours, or get a quick chair massage at your health food store. Even self massage can offer beautiful benefits. Just like using essential oils, if you can incorporate massage into your life in a regular way, you can start to experience some amazing effects. I hope the recipes in this newsletter give you a sense of that!